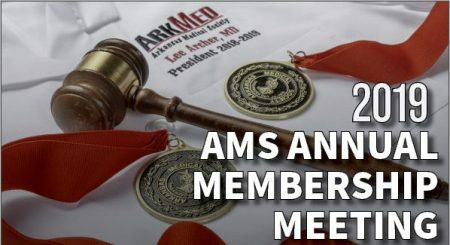 Join fellow physicians at the 2019 AMS Annual Membership Meeting on Friday, April 26 at the DoubleTree Hotel in Little Rock. This one-day meeting will provide CME opportunities, as well as a chance to discuss advocacy efforts from the legislative session and to network with your peers. AMS Family Night at the Travs on Thursday, April 26 at Dickey-Stephens Park. (Reservation required and space is limited). CME topics on opioid regulations, physician wellness and burnout, legislative report, telemedicine, and more. Awards Luncheon honoring the top physician member and lay person who have made outstanding achievements in medicine and healthcare, along with 50-Year Club Luncheon to recognize long-standing members. President’s Gala that evening with installation of 2019-2020 President Dennis Yelvington, MD, and recognition of new board members. We have a limited number of exhibitor booths and sponsorship opportunities. This is a great way to reach Arkansas physicians, and if you would like to participate, visit our sponsorship page. Registration will open soon. Stay tuned to our events page for when that date will be. For room reservations at the DoubleTree Hotel in Little Rock, call 866-238-4218 and mention AMS for the group rate. Stay tuned for updated conference agenda and speakers. If you have questions, please call 501-224-8967 or email ams@arkmed.org.